Condé Nast nods for Sheen Falls, Ashford Castle, K Club and Adare Manor cap an extraordinary week for Irish tourism. Another day; another travel bible showering praise on Ireland. Yesterday, the country featured on Lonely Planet's Top 10 to visit in 2015. Now comes the news that readers of Condé Nast Traveler magazine have named four Irish hotels among their Top 10 European Resorts. Sheen Falls Lodge tops the list at No.1, with Ashford Castle ranked second, the K Club fourth and Adare Manor rounding off the Irish showing in tenth place. Condé Nast Traveler's Readers' Choice Awards are published annually, and this year featured over one million votes from almost 77,000 readers. Several lists of best cities, islands, hotels, resorts and cruise lines are drawn up from the results. Sheen Falls Lodge, which overlooks the picturesque Sheen Waterfalls, also ranks 82nd on the global list of Top 100 Hotels & Resorts. “We are extremely honoured to be named the number one resort in Europe and to be one of four hotels from the UK and Ireland in the Top 100 hotels and resorts in the world,” said Patrick Hanley, General Manager, Sheen Falls Lodge. 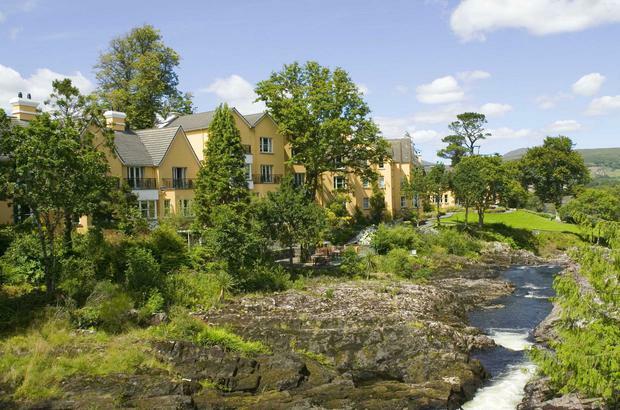 The Kenmare five-star is commended by readers for its "first-class service" and "very pretty views", according to the magazine. Its “very high-quality design” also merits a mention. Ashford Castle, which ranks 97th in the world, is described as "in a class of its own". The Cong, Co. Mayo five-star has “beautiful grounds, fantastic recreational activities" and “outstanding service", according to readers. Formerly the Guinness family home, the hotel's guest rooms come with high ceilings and four-poster beds, the magazine points out, "though they can be tired looking." The five-star is currently undergoing an extensive refurbishment programme. Connemara's Ballynahinch Castle also features, ranking 23rd of 25 Top Hotels in Europe. "The setting is something out of a fairy-tale book - lush greenery, lake, silence," readers report. "It’s just gorgeous, like a rich uncle’s country estate." The Condé Nast citations cap an extraordinary run of international recognition for Irish destinations and hotels overseas. In addition to Lonely Planet's Top 10, Enniskillen’s Lough Erne resort recently topped the Huffington Post's "Best Hotels for Winter 2014/15" round-up. The full list of Readers' Choice Awards winners can be accessed here.